Wayne and I share in the prep work for dinner most nights. Two or three times a week this involves chopping cauliflower into “tiny trees”. Wayne knows the drill, and does a good job cutting the florets into pieces not much larger than a table grape. We then turn the cauliflower into a hot skillet with a bit of salt, olive oil, and whatever spices and seasoning strike our fancy that night. Cauliflower is endlessly adaptable, and cooking it this way is quick and delicious. 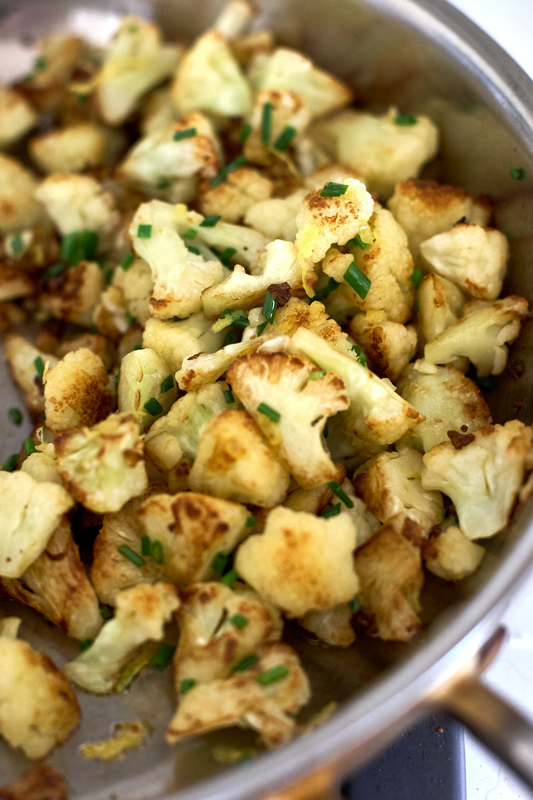 After just a few minutes in the pan the cauliflower starts to brown, and then takes on a deep, nutty flavor. I'll share the version we made the other night – pan-fried cauliflower with garlic, chives, lemon, Parmesan, and flaky sea salt. This handful of ingredients is what hit the pan this time around, but I'll also list off a few other variations that make frequent appearances in case chives and lemon aren't your thing. Spicy: This is the easiest – olive oil, a bit of Piment d'Esplette, garlic, and lemon zest at the end. Use your favorite red pepper flakes. Curry: I sometimes use coconut oil here in place of olive oil. Then I add a favorite Indian curry powder, and go from there. Or I'll take it in an entirely different direction and add a teaspoon (or so) of Thai red curry paste to the coconut oil. Nutmeg: I use 1/2 olive oil and 1/2 butter, then the cauliflower, and some freshly grated nutmeg toward the end. A couple serving ideas: It might sound a bit weird, but I like to eat this style of cauliflower over an open-faced egg salad sandwich for lunch. Or, I might build a meal off the cauliflower by throwing a bit of tofu or seitan in the pan. It's also great on top of a curry bowl, or bowl of chili. Anyhow, people who don't typically like cauliflower seem to like it cooked this way. But be sure to seek out good, fresh cauliflower with tight florets, no discoloration. If there are leaves they should be bright and intact, not withered and funky. 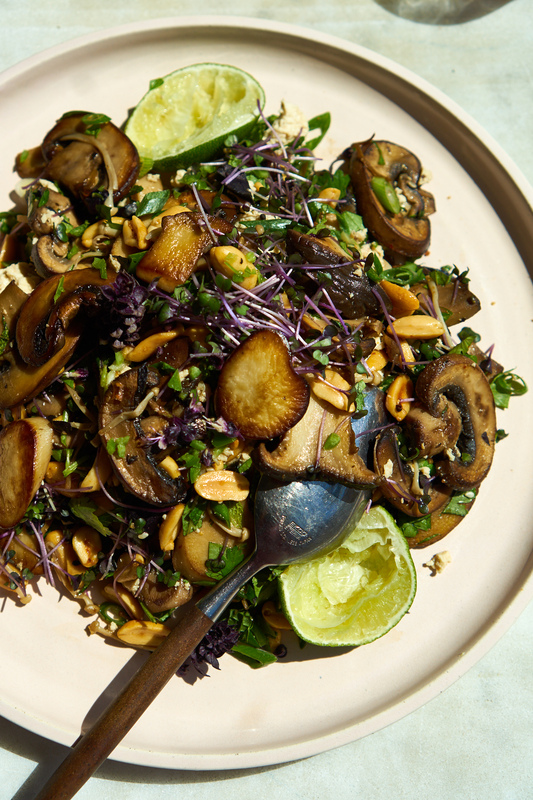 I'm hoping a good number of you will give this mushroom salad a go. I'm pretty sure you'll love it! This is a solid example of my favorite kind of recipe – quick, flavor forward, and endlessly adaptable. Are you a fan of mushrooms? Then this recipe is especially for you. Here's how it goes. 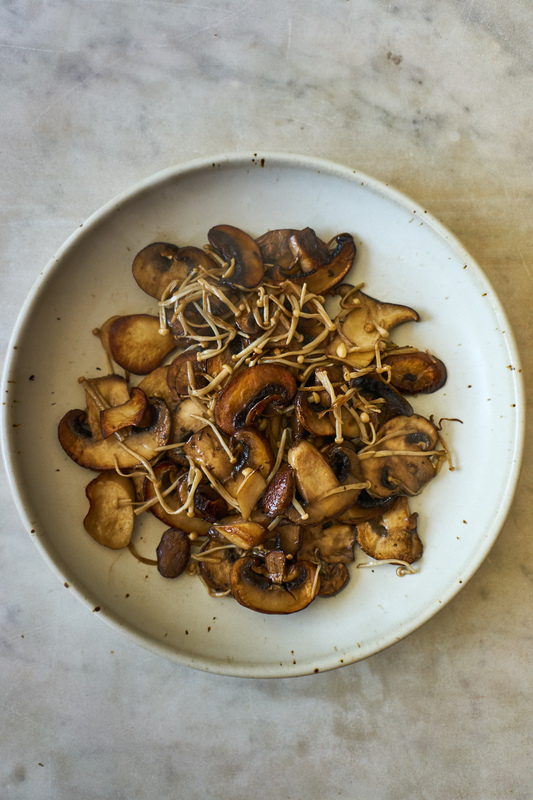 You sauté thinly sliced mushrooms in a splash of olive oil and cook them until they're super golden and beautiful. Then you toss them in a bowl with fresh herbs, peanuts, freshly chopped herbs, serrano chile, a good amount of lime juice, and soy sauce. Done. This is a mixed mushroom salad (as pictured). I used cremini, king trumpet, and enoki mushrooms. That said, you can certainly make it with a single type of thinly sliced mushrooms. When you are preparing them just be sure to slice them consistent thickness – roughly 1/4-inch. These is a shot of the mushrooms pre-cooking (below). Followed by a photo of the color I like them to have when done cooking. 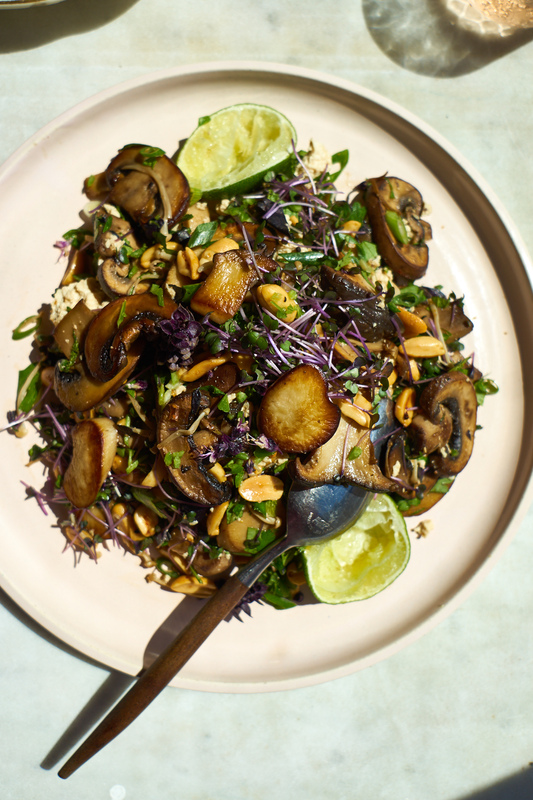 Mushroom Salad with Tofu (as pictured): For more of a one-dish meal, I like to add a bit of crumbled tofu, or steamed tempeh. Mushroom Salad over Rice: This is delicious over just about any type of rice you like. A simple bowl of brown jasmine, mixed rice & grains, or even congee! 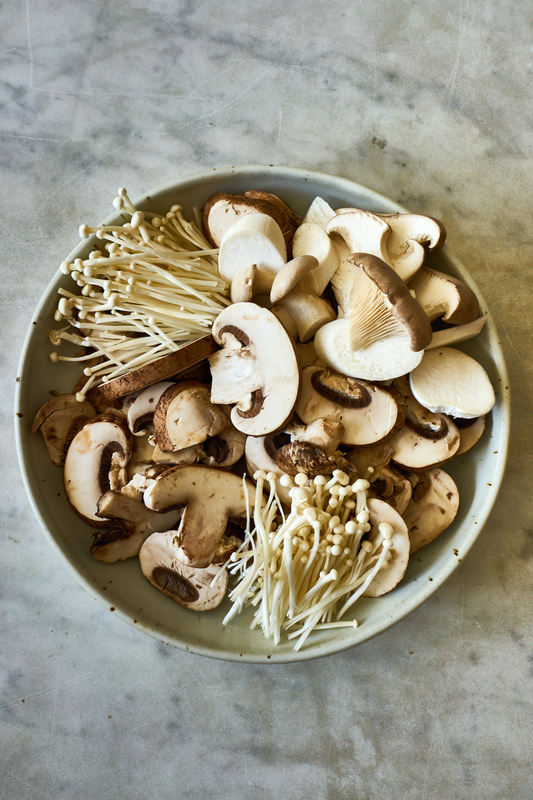 Mushroom Salad over Noodles: Lots of things are great with noodles, and this is no exception! You can toss it rice or soba noodles along with the rest of the ingredients. Just bump up the amount of lime juice and soy sauce, so you have enough dressing. Today's recipe is a fantastic mash-up of sorts. It's an Insta-friendly riff on the Chickpea Cauliflower Korma recipe in Jennifer Iserloh's The Healing Slow Cooker. An Instant Pot korma. I paired it with the high-impact Indian-spiced Simmer Sauce from Coco Morante's The Essential Instant Pot Cookbook. If you have a simmer sauce on hand, whether it's this aforementioned one, or a store-bought version you love, this couldn't come together more quickly. It's the perfect vehicle to get all sorts of goodness into your body in one, delicious sitting. I love this recipe because it's absolutely packed with power ingredients, including a nice range of fragrant spices. I like to think I get a lot of spice in my diet, but I think the real key is integrating spice blends into lots of meals. Not just a few times a week, but daily. For example, the simmer sauce has coriander, cayenne, cumin, turmeric, paprika, and whatever spices are in your garam masala blend. It's how you shift from single notes to a chord. Side note – Another way to get a medley of spices and power-ingredients into your meals are pastes. That's part of the reason I love strong curry pastes like this one, or a boosted miso paste like this one. Lastly, if you have an Instant Pot, be sure to poke around this new section with all the instant pot recipes in one place.